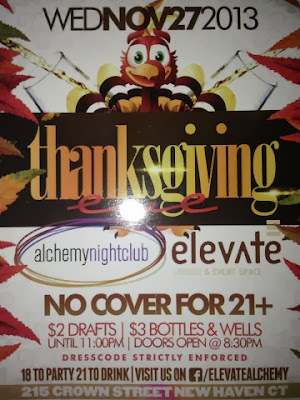 What's Up New Haven: Thanksgiving Eve Party at Elevate Nightclub! Cover & Drink Specials All Night! Thanksgiving Eve Party at Elevate Nightclub! Cover & Drink Specials All Night! This Wednesday!!! Before you fall into the inevitable Thanksgiving food coma, get your dancing shoes on and head over to Elevate at Alchemy -- CT's largest nightclub! You'll have a DJ spinning Top 40 hits all night, so if you're looking for some budget-friendly beverages and good tunes -- Elevate nightclub is your spot!! Doors open at 8:30pm. Btwn. College and Crown St.